This will be particularly useful if you’re formatting the page numbers on a PhD or other thesis or dissertation – many of my student clients don’t know how to do this, which is what inspired me to write this series of articles. 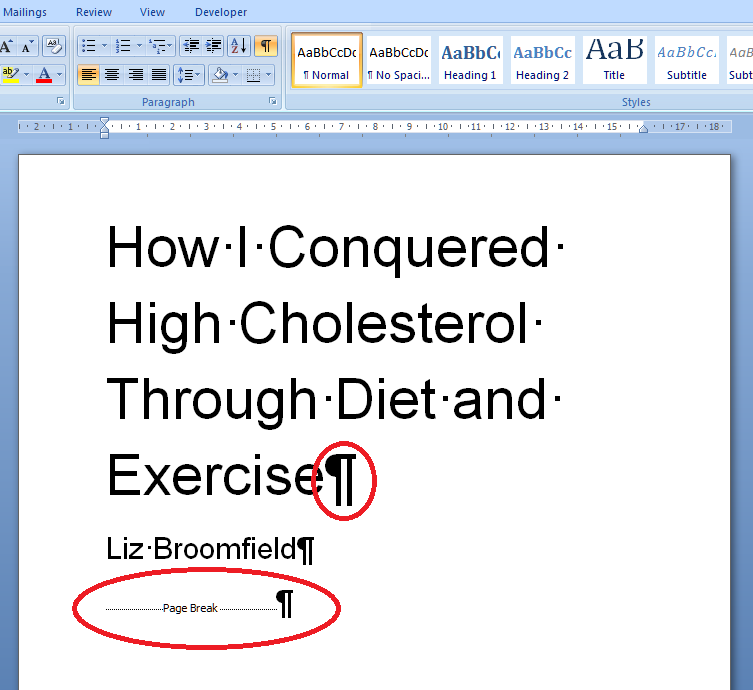 How can I have different page number formats in different parts of my document? Now imagine that you’d like to have different page numbering for different parts of the document – for example, no page numbering on the title page, Roman numerals for the contents pages, and then the numbering continuing in Arabic numerals for the main body of the text. Look at a non-fction book or someone else’s thesis and you’ll see that this is how they’re often laid out. 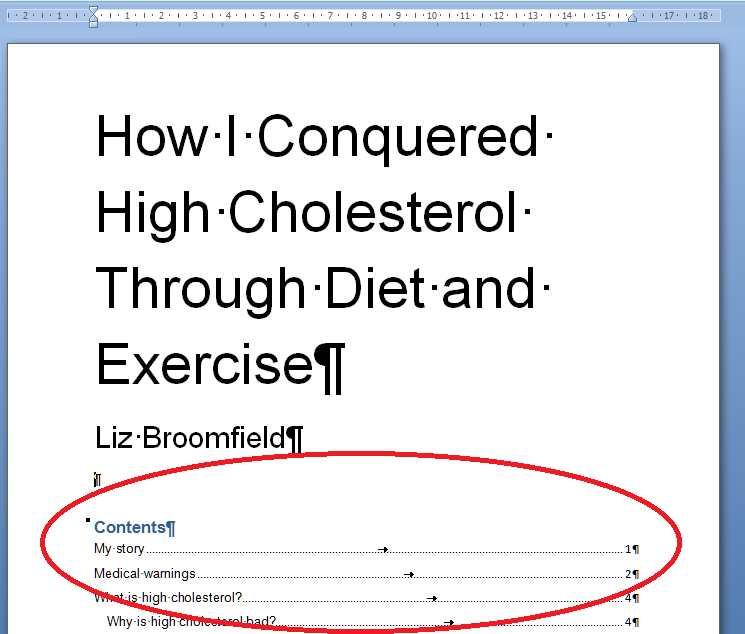 How do I see what formatting I have in my document? 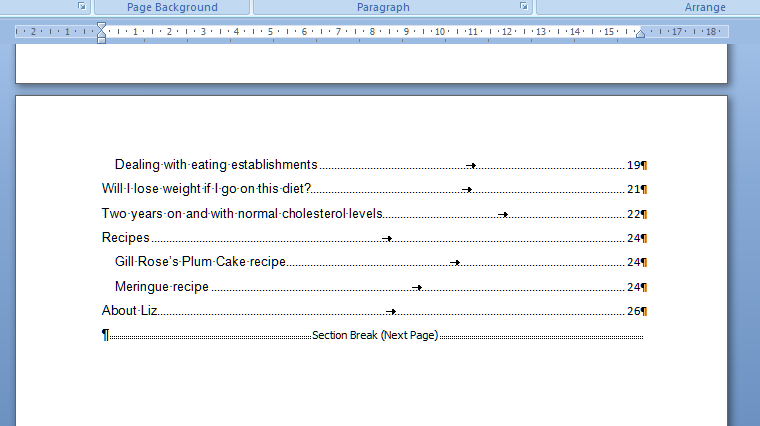 If you plan to insert section or other breaks in a document, it’s useful to be able to see what breaks you have in there already. In the document I’m using an example, I would suspect that the aurhor has added some sort of breaks to make the contents page and then main text start on new pages. Once you’ve pressed the button, you’ll find all sorts of strange marks appear. You can also see that the new page has been started by inserting a Page Break (and not using the Enter key – hooray. If you want to know the reason for the “hooray”, read this article. The paragraph mark indicates a return, and the Page Break label shows that a page break has been inserted here. That’s great if you just want to start the next chunk of text on the next page, but we want to format each section differently, and this requires a section break rather than just a page break. How do I insert a section break? 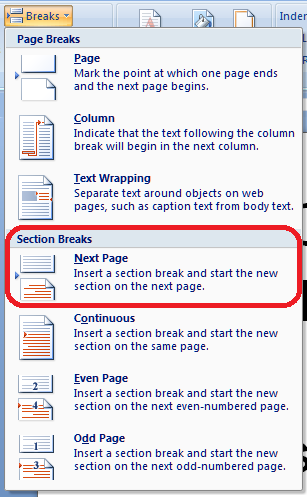 When you press the Breaks button, you’ll see a menu offering several different options for the break you wish to insert – including our old friend the page break and our new friend the section break. … a Section Break (Next Page) appears on your page. And the Contents page has moved back to Page 2. How do I add different formats of numbers to different sections of my document? Now it’s time to add those page numbers, remembering that we want no page numbers at all on the title page, the Roman numerals on the conents pages followed by Arabic numerals for the rest of the document. 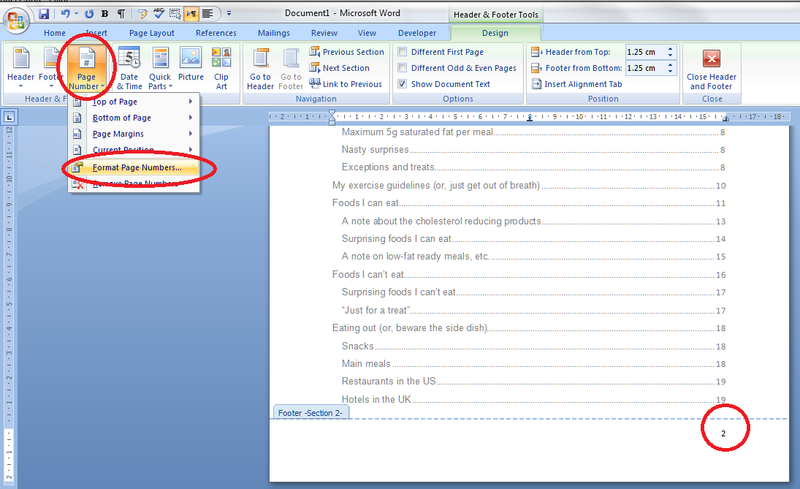 We’ve seen how to add page numbers before, using the Headers and Footers on the document. We’ll do that in a moment. But this time we need to do something else first: we need to remove the association between each section and make tat sure each one is independent. This will allow us to assign different page number formats to each section (and other formatting – I’ll write about this another time, but it’s the way you get your document to let you have certain pages in landscape rather than portrait orientation, etc. How do I stop my footer having the same format as the previous section? 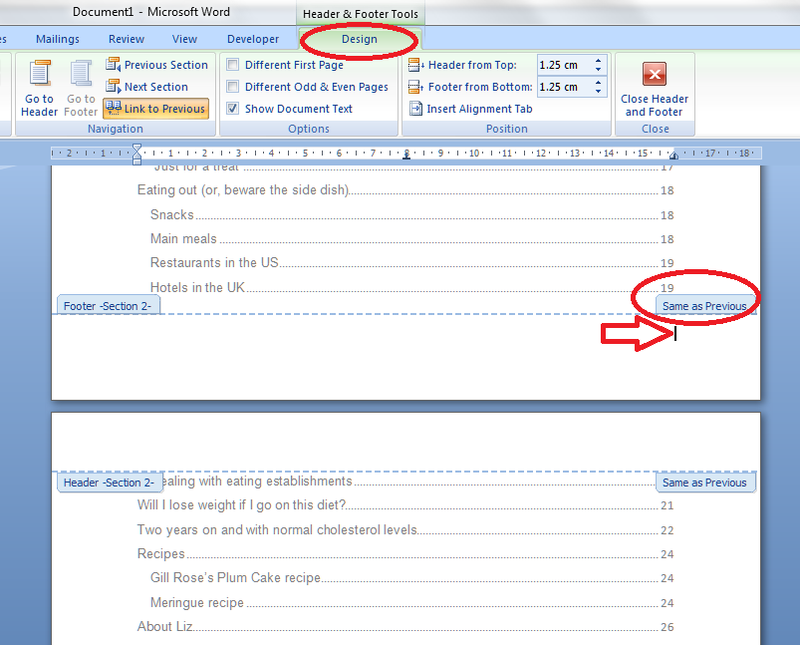 The trick here is to make sure that the footers do not simply copy the previous section of the document. if they do, you will have trouble making each section different. We now need to go into the second section of the document and disconnect its footers from those of the first section. So, first of all, go into the Design tab or just left click on the bottom part of your page, below the text. In both cases, the Design tab will display and you need to look at the Navigation area. You will see that the footer automatically decides to be Same as Previous – we need to disconnect this footer from the previous one. Up in the Ribbon, Link to Previous is highlighted, reminding us that this section’s footer is linked to the previous one and providing a handy hint as to how to stop that. 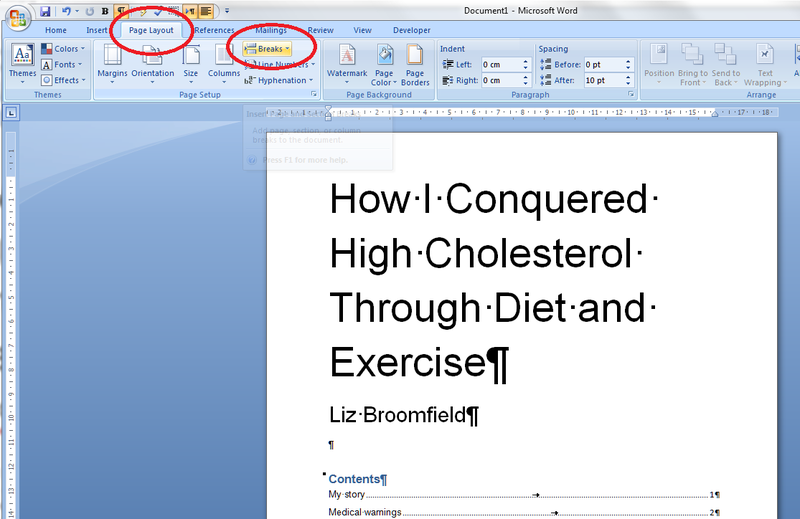 Note that the Header has its own ability to Link to Previous, which is separate from that of the Footer, which means that you can keep any header text you’ve added to the document working throughout the document without needing to re-insert it into each section. 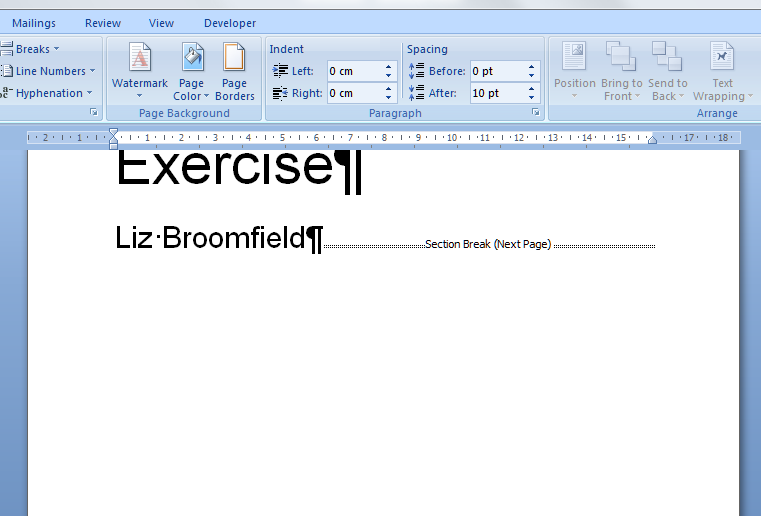 Now we’re ready to add the page numbers to the document. 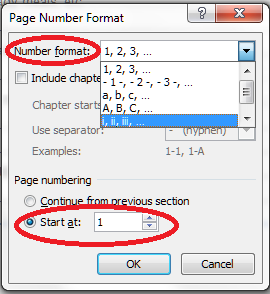 Ignoring Section 1, which doesn’t need a page number, we can go into the page number add part of Section 2. 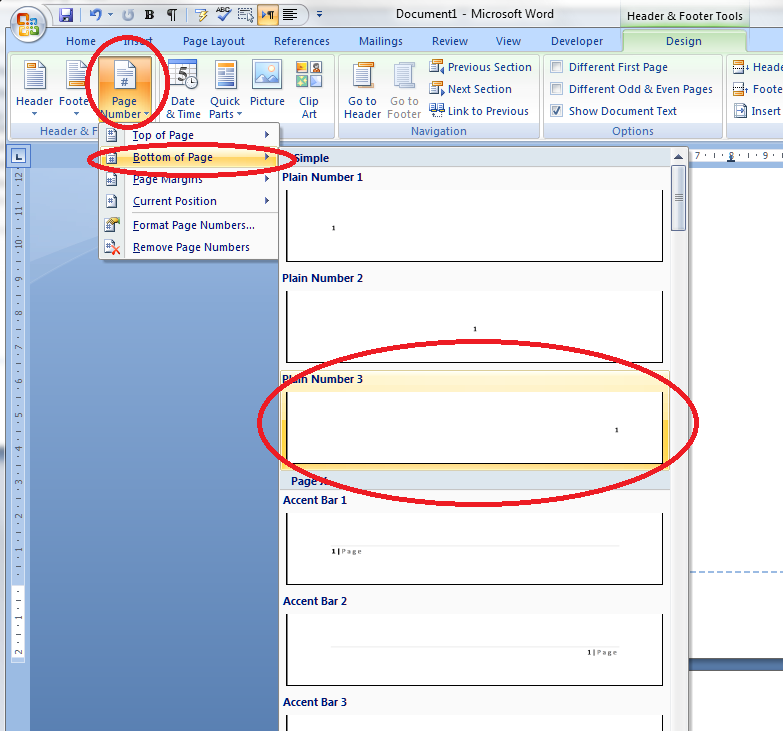 Just to remind you, that’s on the Page Number area of the Design tab, and in this case we want to add a page number at the bottom of hte page, so we select Page Number then Bottom of Page and the particular position we require, so as to set up the page number position before formatting the actual numbers. And look – as if by magic, the page number is now i instead of 2.
and there’s a lovely figure three. And while individual institutions’ formatting rules still take precedence, this is what most of my PhD students like their thesis page numbering to look like. In this article we’ve learned how to add different kinds of page number to different parts of the document, and more complicated formats for page numbers. If you need more of a recap on the basics of page numbering, see the article on that topic. 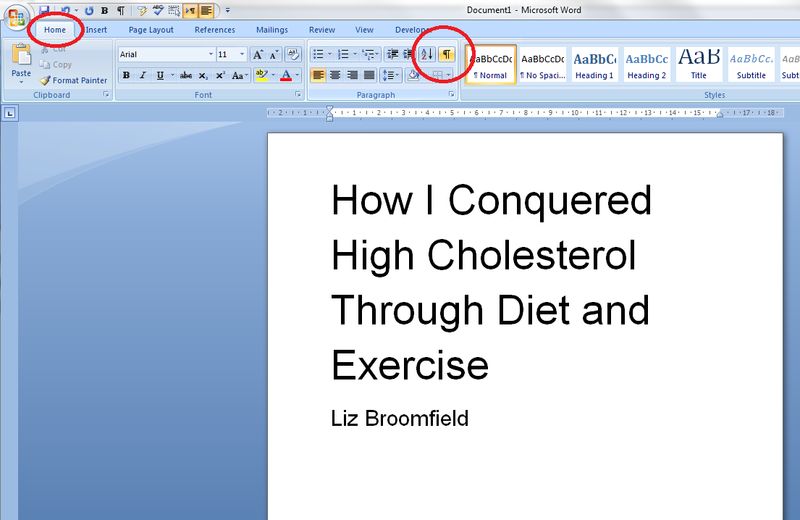 If you’re at all interested in my anti-cholesterol diet book which I used as an example in this document, find out more here. Thanks for your comment, Owen, and I’m very glad that I’m able to help. I hope more students find out about this post as it’s a tricky one to have to deal with, especially close to your submission date! 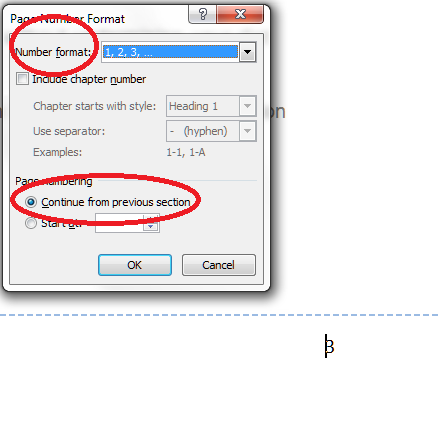 Thank you.The best explanation and help for formatting page numbers. Thanks for your question. You should be able to go to format page numbers and sort matters out from there … let me know if that doesn’t work, including a note of which version of Word you’re using and whether you’re on Mac or PC. I left a comment a coupe months ago and likely missed your response. I have a lot of documents that i just moved into a new Word document. While the page numbers print correctly when the document is initially opened the footer on page one always indicates page 1 of 2. As soon as i double clink the footer it updates to the correct number of pages. Odd, I don’t seem to have seen that comment. Does it stay OK once it’s updated? I would pick up the whole document and paste it into a whole new one or do Save As and give it a new name, in case it’s some sort of weird artefact from the first of the documents you combined.